When I arrived in Spain, I was struck by the juxtaposition of its ancient artifacts and historically significant architecture with its tropical scenery. I had been to European cities with old churches and to tropical cities with palm trees, but when they both came together I couldn’t help but be amazed. 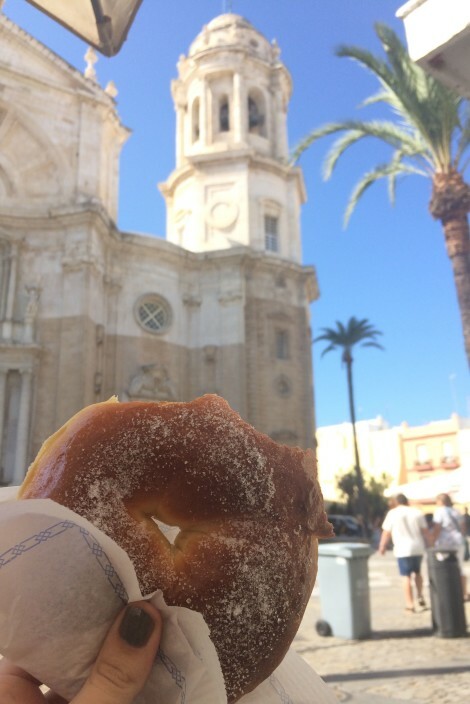 This photo features a salvavidas de manzana (apple “lifesaver,” a pastry filled with apple pie-like filling) from a local bakery, with a striking backdrop of a local cathedral and palm trees in the center of Cádiz, Spain. Cádiz is an important Spanish port, with historical features from the Roman era that continue to be discovered to this day. This photo demonstrates the many levels of importance apparent in Cádiz, from churches to palm trees, and ancient history to tasty snacks.